This past Friday, UMD for Clean Energy hosted US Senator Ben Cardin at the University of Maryland for a Clean Energy Town Hall. It went pretty well, we had a good turnout, I counted 70-80 attendees at the event, tough and smart questions, and a good speech by Cardin about the need for the US to act. While there was some disagreement with the Senator over the merits of nuclear power, common ground was largely found on the rest of his articulated positions, particularly over the need to not have offshore drilling of the coast of Maryland, which would threaten the Chesapeake Bay. Cardin expressed appreciation for the leadership efforts of students at the university, and the strong showing of support for US leadership on climate. He said he can go back to DC and point to examples like us to his colleagues as reasons why our country has no excuse not to act. Below is the article in The Diamondback about the event (it called nuclear power renewable, I will ask for a correction), as well as a video UMD for Clean Energy made. We showed it to Senator Cardin at the start of the town hall. What’s impressive about this video is that none of these statements by students were scripted. This highlights how knowledgeable and engaged students at UMD are on this issue. An upcoming federal bill aimed at tackling the country’s numerous environmental issues should enable the country to make progress toward clean, renewable energy by offering reforms such as protecting the Chesapeake Bay from offshore drilling, Sen. Ben Cardin told a group of students Friday. Cardin (D-Md.) spoke to a few dozen students in the Stamp Student Union’s Benjamin Banneker Room at a town hall forum sponsored by UMD for Clean Energy. The event was designed to give students a chance to question the senator about upcoming environmental legislation. One climate bill in particular — which has already passed the House of Representatives — may come before Cardin and his colleagues in the Senate within the next week, he said. Cardin said he hopes this bill will protect the Chesapeake Bay from offshore drilling, institute cap-and-trade policies and invest in renewable forms of energy, which are issues Cardin said should be tackled now — strengthening what he called a watered-down bill passed by the House. However, Cardin argued citizens of the state should not take this opportunity for granted because the Chesapeake Bay is constantly at risk for pollution. Cardin said one of the primary ways to preserve the Chesapeake Bay and other bodies of water is to create an energy policy that will rely less on polluting fossil fuels — including oil, particularly from foreign sources — and more on renewable sources of energy, such as nuclear, solar and wind energy. Cardin also described a proposal to create a national cap-and-trade system, in which each company would be allocated an amount of pollutants its operations may emit and a company with minimal pollution could sell its allocation to one that is less eco-friendly. Cardin’s proposal would remove a set price for carbon emissions, letting the market decide the value of carbon pollution. Students at the forum largely agreed with Cardin’s policy proposals, but junior environmental science and policy major Cara Miller said she was not completely convinced nuclear energy was worth investing in considering nuclear waste’s potential danger. Senior government and politics major Matt Dernoga, a Diamondback columnist and UMD for Clean Energy’s campaign director, said that among the numerous issues that Cardin hopes to tackle, the most important was ensuring federal standards would not prevent this state from excelling in its environmental goals. Cardin told students Friday that he was especially optimistic about the climate bill given how much the university has improved its sustainability practices in recent years. The Senator is a member of the Senate Environment and Public Works Committee and has been a strong supporter of clean energy and climate change legislation. He has co-sponsored the Clean Energy Jobs and American Power Act, which would provide significant investment in the clean fuels, clean vehicles and public transportation. He also has co-sponsored the International Climate Change Investment Act, which promotes the economic leadership and competitiveness of clean energy. WHEN: Friday, April 23 at 2 pm. I have an Op-Ed column in my school’s college newspaper: The Diamondback. 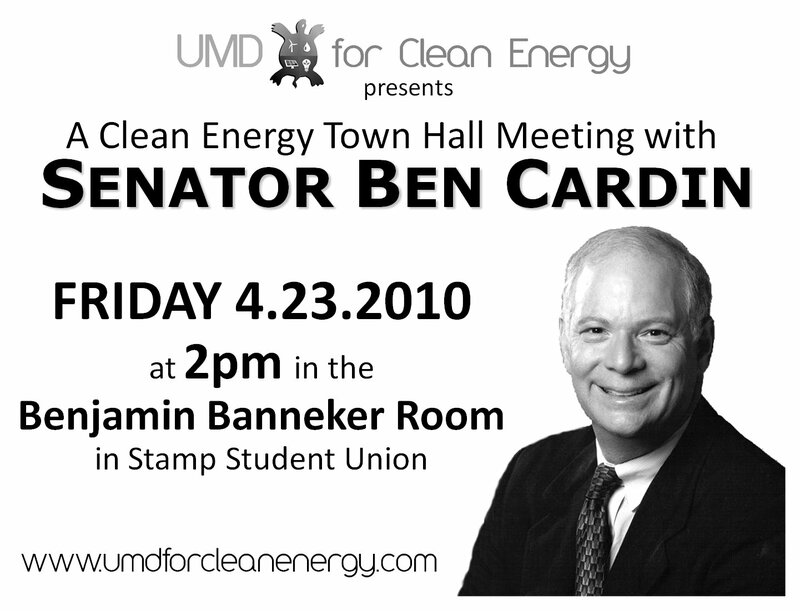 It summarizes some of the main reasons why we need to pass climate legislation, mentions the release of climate legislation in the Senate, and alerts students of a Clean Energy Town Hall with US Senator Ben Cardin that my group UMD for Clean Energy is holding this upcoming Friday. If you’re in Maryland, you should come. Senators John Kerry (D-Mass. ), Joe Lieberman (I-Conn.), and Lindsey Graham (R-S.C.) are scheduled to release their long-awaited comprehensive clean energy and climate legislation to the U.S. Senate on April 26. This will begin the most important environmental debate of our time: whether to reduce greenhouse gas emissions that are warming the planet. Job creation will be spurred by protecting us from carbon pollution. Companies in the private sector will find it more economically beneficial to invest in clean and renewable sources of energy. The infrastructure that comes along with building wind and solar farms such as a modern electric grid will drive even more job creation. Existing buildings and homes will be retrofitted by their owners to reduce energy costs. For every $150 billion invested in clean energy, 1.7 million new jobs will be created. The science is irrefutable. Of the climate scientists actively publishing climate papers, 97.5 percent endorse the consensus position that humans are causing global warming. The average ice mass and volume of the Arctic, Greenland and Antarctica have rapidly declined since the middle of the 20th century. The past decade was the warmest on record. If we take all of the carbon dioxide stored underground and release it into the atmosphere, we will have a different planet. Our health is damaged by the pollution from burning fossil fuels. Reducing the amount of fossil fuels we burn will improve our quality of life and reduce our health care costs. Health issues correlated with fossil fuel burning include asthma, lung disease, lung cancer, elevated mercury levels and cardiovascular disease. Between 317,000 and 631,000 children are born in the United States each year with blood mercury levels high enough to reduce IQ scores and cause lifelong loss of intelligence. Our national security will be strengthened. Despite talk about the need to reduce our oil dependence, we are still paying foreign countries hundreds of billions of dollars a year to send us oil. By regulating carbon pollution, we’ll be incentivizing fuel efficient cars and accelerating toward battery-powered vehicles. A recent study found reducing our emissions 80 percent by 2050 would cut Iran’s revenues from oil by more than $100 million a day and $1.8 trillion by 2050. The world is watching us with bated breath. Negotiations among nations to jointly reduce greenhouse gas emissions have slowed to a snail’s crawl since the Copenhagen summit last December. Until we’ve got a piece of legislation passed to fuel these talks by placing a declining cap on emissions and with funding to prevent deforestation, adaptation and mitigation assistance, no one is convinced the United States is actually at the table. On Friday, there’s a Clean Energy Town Hall with Sen. Ben Cardin (D-Md.) at 2 p.m. in Stamp Student Union’s Benjamin Banneker Room. It’s conveniently the day after Earth Day and right before the climate legislation is set to be introduced, so you should come. If you’re still unimpressed, Friday is also William Shakespeare’s birthday — and John Cena’s. There, that should cover everyone. It has to. 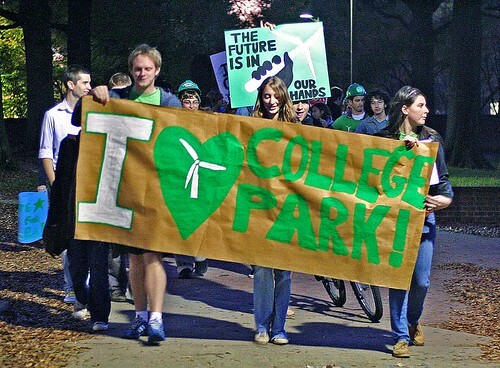 Last night, UMD for Clean Energy held its major event of the semester, Making East Campus a Beast Campus, and it rocked! I counted 70+ students, College Park civic activists, half the College Park City Council, the Mayor, and Vice President for Admin Affairs for the university, Ann Wylie. At this event, we called for the university to make it’s upcoming $900 million East Campus development a model for universities across the country. While the East Campus development plan boasts a fancy movie theaters and restaurants, there’s one thing UMD for Clean Energy would like to see it become — beastly. UMD for Clean Energy held a panel in the Stamp Student Union last night as part of their “Making East Campus a Beast Campus” project. A group of experts discussed how changing East Campus for the greener would stand to benefit the university. About 60 students attended the discussion and provided feedback and suggestions on how to improve plans for the development, which was disrupted last year when the main developer pulled out of the project. The panel consisted of Tom Liebel, the associate principal architect at Marks, Thomas Architects — a firm that specializes in sustainable building — James Foster, president of the Anacostia Watershed Society, and Ralph Bennett, director of Purple Line Now. The panel did not include any representatives from any potential East Campus tenants or prospective developers, who would be responsible for covering the high costs of eco-friendly technology. Vice President for Administrative Affairs Ann Wylie attended the meeting. During the question-and-answer session, she pledged the development process would be transparent, and the development itself as green as possible. The vast majority of attendees were students, many of whom UMD for Clean Energy officials said were unaffiliated with eco-action groups. Participants were encouraged to discuss the viability of the environmental options the group is asking the administration to consider. The group has already developed a general platform of what they want to see, including carbon-neutral buildings, businesses that cater to students and fewer parking lots. The East Campus development will be inherently more sustainable than previous university projects that were built on forested areas because it can reuse pre-existing materials and is a more efficient use of land, Liebel said. UMD for Clean Energy members also emphasized the importance of having locally owned businesses that would appeal to students, such as a grocery store within walking distance. If the local population is targeted, they said, fewer people from outside College Park will visit, and there will be less traffic. With fewer people driving in, the focus can be on alternative transportation. Other environmental concerns, such as runoff from buildings contaminating the Anacostia River, were brought up, although diverting the excess waste could prove challenging. Calabrese said the environmental importance of waste management should not be “stifled by the bureaucracy” associated with the development process. Numerous states around the country have adopted legislative changes that allow municipalities within them to set up these kind of clean energy loan programs that give out loans to residents and businesses, and collect the repayments over a considerable period of time through their property taxes. My student group UMD for Clean Energy at the University of Maryland made this kind of a loan fund for energy efficiency a major election issue last fall in our local College Park city council elections. With enthusiasm from the city council to establish such a program, we faced a setback when the state of Maryland did not adequately permit municipalities to do this. Our focus turned to advocating for legislation in this Maryland legislative session that would allow us to create our own clean energy revolution in College Park. An added positive is it would clear the way for other municipalities all around the state to do PACE as well. With state legislation introduced and the committee hearings coming up, we are pushing to ensure the legislation isn’t gutted like last year. Below is a column by our Organizational Director Laura Calabrese on our efforts to get this legislation through Maryland, and to make our town of College Park a leader. Enjoy, find out more, pass along the video, and stay tuned! Solar water heaters, Energy Star appliances, white roofs, compact fluorescent lightbulbs. These phrases seem to describe smart home improvements that we will use to save energy in a distant, futuristic time (when we’re not in a recession). In reality, it’s 2010. Renewable energy and energy efficient technologies are well-developed and ready to go, and implementing them now could put us on our way to economic recovery. With the help of state Del. Sue Hecht (D-Frederick) and state Sen. Thomas Middleton (D-Charles), the College Park City Council and the student advocacy group UMD for Clean Energy are working to bring these innovations to College Park. Last month, Hecht introduced the clean energy loans bill to the General Assembly. If passed, it will make it possible for municipalities in the state to create programs that would provide homeowners and businesses with the opportunity to take advantage of these cutting edge technologies. These dynamic programs are called clean energy loan funds. Each fund creates a pool of money for residents or businesses in a given city or county to take out low-interest loans that would finance clean-energy upgrades and energy efficient improvements. Borrowers could pay off their loan through property tax assessments in increments roughly equal to their energy cost savings and continue to reap the savings once the loan is paid off. The fund would be self-sustaining — within a few years it would receive the return on investment, which can then be loaned out again. UMD for Clean Energy has been advocating for a loan fund in College Park since last fall and is discussing the implementation of a program with an enthusiastic city council. The idea gained national attention after recent successes in New York; Portland, Ore.; Boulder, Colo.; and San Francisco. New York’s Green Jobs/Green New York program has committed $112 million to retrofit and weatherize homes and businesses, and San Francisco’s Property Assessed Clean Energy program has $150 million in bonding capacity available. The programs require an energy auditor to go through and identify opportunities for clean energy innovation in the building and a contractor to go in and make the improvements. Besides creating economic opportunity and saving people money, installing these technologies means cleaner air and a reduced risk of climate change. Win-win-win-win. These types of policies are being pushed at all levels of government. The Energy Department promoted the Energy Efficiency and Conservation Block Grant Program at the end of 2009 that provided grants to local governments for whole-neighborhood energy retrofits and other projects to reduce local energy use. This initiative, which had up to $454 million available, shows the ongoing push for green investment everywhere. To receive a grant of this type, a government must show that they have a plan for how to use the money. By enabling cities in this state to adopt loan fund programs, the clean energy loans bill will open tremendous opportunity for cities such as College Park to receive significant green investment. This is a clear-cut opportunity to create a local market for clean energy and reduce our impact on climate change and our pocketbooks. We have dedicated student activists who are working with a progressive city council to make it happen right here. In the not-so-distant future, College Park will join New York and San Francisco at the forefront of the clean energy revolution. Call your state representatives today to speak in support of the clean energy loans bill: House Bill 1014 and Senate Bill 720. For more information, visit http://www.umdforcleanenergy.com/clean-energy-loan-program.html. Laura Calabrese is the organizational director for the student group UMD for Clean Energy. She can be reached at lcalabre at umd dot edu. UMD for Clean Energy’s Media Director Lisa Piccinini has an op-ed in the Diamondback today about our group’s plans for the semester. Enjoy! With the news the Wooded Hillock may be saved from development, the campus is abound with positive attitudes — thinking maybe, just maybe, the university can truly be receptive to environmental concerns. This past September, the adoption of the university’s Climate Action Plan, a plan required by the American Colleges and University Presidents Climate Commitment that university President Dan Mote signed, signaled we may be on the right track. This momentum has also spread into College Park. Last semester, working with District 1 Councilman Patrick Wojahn, activists from the student group UMD for Clean Energy vetted the idea of an energy efficiency loan fund to the College Park city council. The loan fund would create a pool of money that could be loaned out at a low interest rate to finance energy efficiency upgrades and home improvements. Borrowers could then repay the loan fund with their energy savings and eventually reap savings after the loan has been paid back. UMD for Clean Energy has already met this semester with representatives in Annapolis with regard to changing a state law to make establishing this fund legal for municipalities and hopes to push forward with an energy efficiency loan fund for College Park. The loan fund was one of many ideas UMD for Clean Energy pushed in last fall’s city council elections. In our ongoing “Green for College Park” campaign, we plan to continue pushing both the city and the university to adopt policies and make decisions that realize our vision of a prosperous sustainable future that arrives sooner than expected. We certainly weren’t the first. Other communities are surging ahead. A new “green street” in Edmonston is set to showcase environmental responsibility through plans for a native tree canopy, use of recycled materials, and bioretention and filtration systems to manage stormwater runoff. The 9,100-acre community of St. Charles is another example of forward-thinking development in the state, with developers looking to double the community’s size while reducing its carbon footprint through green design, creating thousands of green jobs in the process. So what’s next in store for College Park? UMD for Clean Energy students have made their voices heard on issues such as the energy efficiency loan fund, which will affect the whole city. But even in our campus bubble, the chance to encourage a sustainable future is great. The university is reevaluating plans for a 38-acre East Campus redevelopment. Will it reflect the same low sustainable development standards like Route 1? Or will it look more like St. Charles? Will we lead, or will we follow? As of now, those questions will be answered behind closed doors by university officials. But as College Park falls to the back of the line, perhaps the doors should be opened and students should be given an opportunity to throw in their two cents as well. We’re looking forward to doing that this semester. You can follow our efforts at http://www.umdforcleanenergy.com or join our meetings each Monday at 7 p.m. in the Jimenez Room in Stamp Student Union. Lisa Piccinini is the media director for the student group UMD for Clean Energy. She can be reached at lpiccinini88 at gmail dot com. Who said anything about qualifications? I never thought I’d be writing a piece on media and messaging. I’m a government major at the University of Maryland going into my final semester as an undergraduate. I’m looking to further my education with a masters in public policy with a specialization in environmental policy. In the student activist group UMD for Clean Energy that I’ve been involved in since the spring semester of 2007, I’ve been the boots on the ground guy getting petition signatures and power vote pledges, the Political Liaison who handled the policy aspects of the campaign like organizing lobby meetings, and last fall I had my first stint as the Campaign Director for the group. Despite my responsibility never being media and messaging, it’s in this area that I feel I’ve learned some of the most valuable organizing lessons. When applied to our group’s efforts last semester, our new approach to media became one of the most powerful engines for our local campaign on making green issues front and center in our College Park City Council elections, and complimented all of the other aspects of our campaign beautifully. At the end of the semester, core members of UMD for Clean Energy tried to put our finger on how and why media had been invaluable to our campaign, but usually our guesses didn’t go beyond “wow”. This is my imperfect yet necessary attempt to explain what happened, with the hope that other groups can gain from it, and at least so I can convey how important this aspect of the youth climate movement is. By the way, I’ve committed the cardinal sin of making this a longggg post, but it’s worth it so please read. In a look back on the semester, the Diamondback’s Dana Cetrone has an article out about how green groups on campus have worked together this semester to achieve common goals. She mentions my group, UMD for Clean Energy, there’s a picture of our big march to the polls, and I even got quoted on Copenhagen at the end, which is good. Whether rallying for alternative energy, fighting to save a nearby forest or mobilizing students to vote in city elections, university environmental groups have been able to rely on one thing this semester: each other. Working on local, national and international levels, university activist groups have relied on networking with on- and off- campus groups to advocate their causes and achieve their goals. This semester, UMD for Clean Energy focused its efforts toward lobbying the College Park City Council to adopt an Energy Loan Fund that would lend money to residents who make sustainable upgrades in their homes. The campaign, which culminated with an 80-student rally in front of City Hall, was successful, Dernoga said, despite having only a few months to educate students on the issue. But Dernoga said the challenge was made easier by working with other groups with an on-campus presence, such as MaryPIRG. “It’s always easier to work with others: There are more resources, and you’re reaching out to more people,” said Brian Lentz, the global warming solutions coordinator for MaryPIRG. Other groups teamed with more established national organizations to gather additional resources. VegTerps, an animal rights group for vegetarians and vegans, teamed with People for the Ethical Treatment of Animals in its McCruelty campaign aimed at ousting McDonald’s from the Stamp Student Union. Although the campaign has yet to banish the fast-food giant, Carr’s efforts earned her a spot on the Stamp Student Advisory Board. Carr said she believes the campaign was successful because it made students aware of McDonald’s slaughter practices. “I hope our campaign makes people realize that people have the power and by doing protests and rallies that power is with the students and that they have power to change the campus,” Carr said. Joanna Calabrese, chair of the Student Sustainability Committee, said she sought a similar university-wide change with her campaign to save the Wooded Hillock from destruction. The university had sought to bulldoze this 22.4 acre forest to make way for relocated East Campus buildings. But the University Senate last week voted to save the hillock, a victory for students and faculty activists, who Calabrese said worked with students to create a petition to send the senate. Activists hope the cooperation that has occurred at the university this semester will carry over to the United Nations Climate Change Conference in Copenhagen, where many of the groups sent petitions with national officials to the conference. The Diamondback has a staff editorial about the road map for the new Mayor, Andy Fellows. They gave a shout out to the need to prioritize environmental issues, and to UMD for Clean Energy’s efforts in the City Council elections. For more about those efforts, see here. “The current council is environmentally friendly, but Fellows, who works for a clean-water lobbying group in Washington, plans to make green issues even more of a priority. The city council owes it to voters to look carefully at environmental issues and to lobby for improvements on a larger stage.